Sophie Seita: First of all, can you tell me a bit about the “materiality” of Alembic, the process of editing and printing the magazine? What kind of paper did you use, for example? What, in your opinion, characterizes the different forms of reproduction, like the mimeograph or offset litho, and how did they affect the form of the magazine? Could you also talk more broadly about the specifics of the changing publishing technologies and formats available to you in the 1970s? Was it mainly a practical decision to switch from mimeo to offset printing? What about technological limits, questions of affordability — how did those considerations clash with, support, or refresh your artistic choices? Robert Hampson: The first issue was a collection of poems by Peter Barry, Ken Edwards, and myself, together with lyrics by Jim Stewart, a school friend of mine who was vocalist and lyric writer for Death Kit, the core of a Liverpool-based multimedia rock band. There was also graphic work by John Simpson, another of my school friends, who was also associated with Zoom Cortex; Robert Snell, who was working on a PhD in art history at the Courtauld; and by Sibani Raychaudhuri, a Bengali children’s writer, illustrator, and short story writer, who was later part of the Asian Women Writers Collective. The main aim was to publish the work Peter, Ken, and myself had been producing and showing to each other through the regular “workshop” meetings we had been holding together. It was produced to coincide with my going up to Edinburgh with Zoom Cortex for the Edinburgh Fringe Festival, hence the involvement of work by Jim and John. We produced a hundred copies and sold most of them in Edinburgh. The format was loose sheets in a plastic sleeve, sealed at each end with staples — which proved not to be a very good format for selling poetry, since it meant, in effect, selling “a pig in a poke” — as the good people of Edinburgh were quick to point out. I was interested in the work of Richard Kostelanetz (in the US) and the idea of an assemblage. It was also convenient as a low-cost means of production: most of the poems were printed (unofficially) on a Gestetner in King’s College London, mainly on white A4 sheets — but also some of the work on smaller sizes of paper and a couple of A5 sheets (one buff, one yellow). Robert, John, and Sibani were invited to contribute — in any format as long as it would fit into the sleeve. The visual work was offset at the expense of the artist: Robert Snell produced the cover, a line drawing with collaged materials (on an ochre background) and an abstract visual (on a blue background); John Simpson illustrated poems by Jim Stewart and myself (both of which had Zoom Cortex connections); Sibani, who had published illustrations for Satyajit Ray’s children’s magazine Sondesh, supplied a line drawing of a fairground. The style is quite different from that of Robert and John, and she didn’t contribute to subsequent issues. The plastic sleeve was produced by cutting lengths off a long roll of plastic which I had salvaged from the previous year’s Zoom Cortex performances in Edinburgh, where it had been used to produce bags for the audience’s shoes: seating for the concerts was in the form of an inflatable with a cargo net thrown over it, and members of the audience were required to leave their shoes at the door. The second issue repeated the concept of an assemblage (the roll of plastic wasn’t yet exhausted.) The issue is all produced on a Roneo duplicator and is predominantly A4. There is a greater use of colored paper, but the overall design is more coherent. Ken had set up Share Publications in 1974 and had acquired a duplicator (he had published a collection of his own poems, Terminal Object, with text produced on the Roneo and a silk-screened cover that same year as the first Share publication.) Ken had learned how to produce visual images on Gestetner stencils, and this had a major impact on the production. Robert Snell’s cover for Alembic 1 is adapted for Alembic 2 to create a visual brand (though we wouldn’t have called it that). Robert Snell’s “ransom note” lettering for the name was retained for all eight issues. The technological developments that underlie the changes in Alembic were really down to Ken and his increasing involvement in printing. Alembic 3 marked our shift from plastic bag assemblages to book form: the standard side-stapled A4 magazine. It is entirely produced on a duplicator — though with red and black ink and on blue and white paper. It looks as if we shared the work of producing the stencils. Ken printed off the pages — and then collating was done collectively. Alembic 4 looks as if itis produced in the same way, although it also looks as if John Simpson’s graphics might have been offset printed and then sent to us. Alembic 5 marks another shift. We had funding for Alembic 5 from the Greater London Arts Association (about £25, I think), and we were able to afford to have the whole thing produced by offset litho. Ken had also sourced a printer for the wrap-round cover (the print room at the National Poetry Centre), which meant that we now had a spine. Bookshops were unwilling to take publications which didn’t have titles on the spine. The other development is Ken’s acquisition of a “golf ball” typewriter, which allowed us a different typeface for 5, 6, and 8. Alembic 6 is a return to mimeo: it looks as if the grant was just for one issue (indeed, Alembic 6 states that the grant was “withdrawn”: I can’t remember the backstory. It might be recoverable from GLAA files.) The offset wraparound cover is sustained, and John Simpson’s graphics again look as if they have also been offset by him and sent to us. The return to mimeo was purely for financial reasons. Alembic 7 is a return to assemblage but this time within an A4 codex format. We sent letters to a large number of poets and visual artists asking them to send us one hundred or two hundred copies of anything that could be bound into an A4 publication. We wrote to people in our network and people outside it, but only the former responded. We published everything that was sent to us. The wraparound cover was produced by Erik Vonna-Michell, who lived with Ken and myself at Lower Green Farm. It was produced on good-quality art paper; the black and grey parts were produced by successive flippings of the inked stencil until it wouldn’t print any further — this was done using the printing press at City Lit, where Erik was taking a printing course. The title was printed by a rubber stamp. Every single cover was different. Alembic 8 was a return to offset for the wraparound cover and for the magazine as a whole. It was typed by Ken and printed by Erik Vonna-Michell using the offset litho that was temporarily lodged at Lower Green Farm. As this suggests, we used mimeo largely for reasons of cost. Money was very tight for all of us: in my case, from 1971 to 1973 I was on a major state studentship at King’s, and then from 1973 to 1976 on a tutorial research studentship at Royal Holloway, and then I worked as a visiting lecturer at Royal Holloway. I didn’t have a full-time post until 1979, which meant I then had the money, but not the time, to bring out Alembic 9. We had typewriters (which meant we could produce stencils) and access to mimeo machines — in Ken’s case, his own mimeo machine. The disadvantage of mimeo was that it was time-consuming to type out the stencils — typing had to be accurate: there wasn’t much room for error — although some corrections could be made using nail varnish. The letters could be a bit fuzzy; you couldn’t get sharp blacks, and there was always the risk of wrinkles. Offset litho was cleaner as a process, less labor-intensive, and produced a cleaner page. This cleaner and sharper appearance of the page was particularly important for visual material. Nevertheless, we did experiment within the limitations of mimeo with different colored inks (once Ken was using his own machine), different colored papers, different sizes of paper, visuals on stencils, and, eventually, a different typeface. Clive Fencott, detail from Alembic 7. Seita: In your emphasis on welcoming transatlantic connections, was there a conscious glance back to such journals as Poetry Review under Eric Mottram’s editorship, Stuart Montgomery’s Fulcrum Press, or to partly contemporaneous journals, like Allen Fisher’s Spanner? But maybe there were others you’d like to mention? Hampson: The transatlantic connections are visible from Alembic 4 (1975–1976), which published work by Geoffrey Cook, Emanuel Ro, and Alan Davies. I was in touch with Alan Davies; I think Davies got in touch with us because of Alembic, which would suggest that Alembic had subscribers and readers in the US from about the third issue onwards. Or, at least, was visible in listings. I know we had US university subscriptions from quite early on, and I think both Charles Bernstein and Bruce Andrews were early subscribers, but I haven’t kept the records on subscriptions, and Ken could perhaps correct me on this. However, a transatlantic element was there from the start. I had just returned from a year at the University of Toronto when we first started meeting up, and Peter was working on an MA in American Studies at the American Institute under Eric Mottram. We had all been taught by Eric as undergraduates. We were very aware of Eric’s work as editor of Poetry Review and were members of the Poetry Society during this period. However, we weren’t really “looking back” at Poetry Review: rather we were aware of it as part of the same “action.” Allen Fisher’s Spanner, Second Aeon, Poetry Information were also important to me as part of my understanding of this action. It is perhaps also worth mentioning Mike Dobbie’s Fix, which went through three issues (1973–1976): we had some overlap and collaboration with Mike in that period, but Fix was more oriented towards a tradition coming out of Dada/Surrealism and was less international in its range than Alembic became. Alembic 4 manifests its transatlantic connection at other levels: through its focus on Allen Fisher, it engages with “place” and open field poetics. Peter Barry supplied “open field notes,” drawing on his reading of various US poets, and laid out in the array method he had learned from Mottram. My own contributions — the six-line epigraph, which reflects my reading in Williams and Olson, and my treated version of an 1846 text — are engaged with US materials. At the same time, the inclusion of sections from Roy Fisher’s City looks back to that earlier moment of transatlantic connection represented by Migrant, while also claiming Roy Fisher as a late-modernist UK precursor. However, the transatlantic interest should be situated in relation to something else which is evident in this issue: an internationalism which invokes, here, a larger European dimension. Thus my contribution “To Callanish from Hagar Qim” invokes a European megalithic culture extending from Malta to the Outer Hebrides, while Ken’s contribution is “the ultimate cinders” from his work Lorca, and Ulli McCarthy contributes “Holzschnitte.” In short, this isn’t simply a transatlantic connection or dialogue, but also an openness to Europe and to other cultures. If Roy Fisher marks an earlier transatlantic connection, he also marks how an earlier European modernism can be recovered in the postwar period through its detour via the US. Alembic 8 is worth considering in this context. It includes work by Lyn Hejinian and Rae Armantrout, but also translations of works by Anne-Marie Albiach, Heiner Bastian, Pierre Reverdy, José Rosas Ribeyro, and Enrique Verástegui — plus the Canadian Opal Nations and the Australian writer Anna Couani. Ken is bilingual (English/Spanish) and has had a long interest in translation; during the Alembic period, Peter had fluent French and I was involved in cotranslating Bengali poetry with Sibani Raychaudhuri. Other journals I was reading in this period included Curtains, edited by Paul Buck; Ochre, edited by Ralph Hawkins and Charles Ingham; Joe DiMaggio, edited by John Robinson; and two concrete/sound poetry magazines, Kontexts, edited by Michael Gibbs, and Stereo Headphones, edited by Nick Zurbrugg. Edwards: I have just dug out the journal I kept for my two US trips, in 1975 and 1976. On the 1975 trip I took a Greyhound bus from New York to San Francisco, where I stayed at the YMCA for one night. I knew nobody there, but I think Emmanuel Ro, a US Filipino poet I’d previously met through my licensed-squat friends in West London, had given me the number of Geoff Cook. He was a poet who had translated Catullus, and he generously put me up in his apartment for a few days. Oh, those carefree times! I met James Sherry in New York in 1976. He and his then-partner had attended a dinner party I was invited to by my original New York contact, a young woman called Rhoda I’d previously met in London. She was in the process of moving in with Richard Fitz, a classical percussionist of some renown who was an old friend of James’s. I only found out towards the end of the evening that James was also a poet/editor, and had recently brought out or was about to bring out the first issue of Roof magazine, which was a special “Naropa Institute” issue. I think it included Ginsberg, Anne Waldman, etc. As I was working for Paul McCartney at the time, I had been ensconced in the St. Regis Hotel (a radical shift from the Greyhound bus/sleeping on friends’ floors regime of the previous year! ), and I invited James around to my room a couple of days later (he must have been impressed!) and gave him a copy of Alembic. For years after that, he was under the impression that I was a friend of Richard Fitz, whom I actually knew not at all. We kept up correspondence thereafter, and he continued to send me Roof, which quickly became a vehicle for the new, weird stuff that was only much later identified as Language writing. Through that, correspondence began with Andrews and Bernstein. I don’t remember whether either subscribed to Alembic or whether we simply exchanged magazines. Herbert Burke, detail from Alembic 7. Seita: How would you describe your networks of friends and acquaintances at the time? Were these friendships visible or was such “friendly” publishing reflected in the editorial choices you made? Many little magazines work in such a way that friends read and publish one another’s work, for favors, as favors (in the sense of regard, goodwill, an inclination to commend), asking each other to read at events out of solidarity and encouragement — it’s almost a “making public” of an affiliation. Would you agree? What kind of distributive networks does such an approach suggest? Edwards: Early issues, certainly the first one, were focused on our own work as poets — I mean, the three coeditors, Robert Hampson, Peter Barry, and myself, who formed the original Alembic Poetry Workshop. The three of us had known each other as undergraduates at King’s College. I was writing short stories at the time, and also rather jejune poetry. The workshop was basically the three of us meeting in each other’s homes, discussing poetry we were reading — Olson, Roy Fisher, Ed Dorn, and others, all new to me — and showing our own work in progress. So the initial impulse was to showcase the writing we were doing, but later the magazine broadened out through personal connections and correspondence. Finding one’s peers was more difficult in those preinternet days, of course. Hampson: Alembic had its origins, for me, in the convergence of a number of friends’ networks: the Liverpool-based Zoom Cortex network, which included a number of my school friends; a King’s network, which linked the three editors; and other friends’ networks, which included Robert Snell and Sibani. Steve Snider (in Alembic 2) was someone I knew through graduate student networks in London: he attended some of our meetings, and was published in a couple of issues, but we soon discovered that his work and orientation differed from ours. As Ken says, the initial impetus was to showcase our own writing. However, the inclusion of work by Mike Dobbie in Alembic 2 also marked the beginning of our contact with other innovative poetry networks in London, and, because of this enlargement of our world, subsequent issues included more work by other poets and expanded to fifty or sixty pages. Thus Alembic 3 was a celebration of the work of Lee Harwood and took off from his 1974 Poetry Society Lecture on “Surrealist Poetry Today” to explore contemporary work in the Surrealist tradition. As this suggests, the brief period when modernist poetics were represented at the Poetry Society was an important context for the early development of Alembic. As the last collectively edited issue, it included various “friend” networks (Steve Snider again; Boudewijn Wegerif was part of Ken’s Notting Hill network; Thomas Wharton was an old friend of Peter’s), but it also brought in Mike Dobbie’s network (which included Jeff Nuttall and Ulli McCarthy), Paul Matthews, an established poet who was the cousin of another contemporary at King’s, and Paul Brown, whom we had met through London poetry-reading networks. Carvalho was an associate of Paul Brown’s; Allan Burgis had published some of my work in his magazine, and I had liked what I had seen of his work there. Alembic 4 was a similar celebration of the work of Allen Fisher, which took off from his work to explore open field poetry, urban poetics, the poetry of place and space. Alembic 3 and Alembic 4 were designed to celebrate and explore work by poets slightly older than ourselves whom we thought of as significant poets. They were also part of a process of educating ourselves in contemporary poetry and its antecedents. As part of this process we were also open to publishing work by poets we met through readings and events in London, through seeing their work in magazines in which we were publishing, and also through submissions. From early on, we received large numbers of submissions — most of them unsuitable for the magazine, but occasionally we were able to print material which came in this way. Alembic 6 follows a similar model to Alembic 3 and Alembic 4: David Miller was a neighbor of Ken’s in Notting Hill, whose work we knew from magazines and pamphlets. The issue was constructed around David’s work: with three poems and two articles as the core. We reprinted a piece by Charles Madge, which David had written about, and work by Robert Lax, on whom David had also written. But we also published work by Allen Fisher, Eric Mottram, Elaine Randell, and Barry MacSweeney as important contemporary work: these four could be seen as part of another network, but Randell and MacSweeney were not known to us personally. I had been put in touch with Rosmarie Waldrop by David and had a correspondence with Alan Davies; Ken had met James Sherry when he was in the US. This was also the first issue not to include our own work. Alembic 7 and Alembic 8 followed this example. By this stage we were no longer publishing the magazine as an outlet for our own work, but rather to represent and develop what we were confident was a significant transnational poetic conversation. This development also relates to the distributive networks employed. The first two issues were sold “by hand” at readings and events, given away, or exchanged. With Alembic 3 we were inviting subscriptions and giving the price in dollars as well as sterling. We have clearly changed from thinking locally to thinking internationally, and we did in the future sell most of our issues through subscription. In the early years, we also had some bookshop sales: we sold through Compendium in Camden Town, Turret Books in Notting Hill, Atticus Books in Liverpool. One problem we realized early on was that the profit per sale was insufficient to cover the costs of postage or transport: sale or return only made sense if the bookshop was somewhere we went to anyway. We did have some on sale in the Gotham Book Mart in New York, but this was purely for publicity purposes. Ken’s point about this being preinternet is worth bearing in mind. Listings in magazines like Mottram’s Poetry Review, Poetry Information, and Second Aeon were an important means of finding out who was doing what, and what was going on. A certain number of copies would go for review or in exchange in order to get a listing. Seita: Related to this, can you talk about the (sometimes unconscious) need of poets, editors, or critics (writing retrospectively) to divide specific groups and authors into factions or, more positively perhaps, the usefulness of forming coterie audiences? In his interview with Ken, Wolfgang Görtschacher mentions the slight antagonism between the London and Cambridge poetry “scenes.” How important or irrelevant were such local or aesthetic divisions for you? Edwards: I’m not very motivated to talk about that. Group formation has its positive and negative aspects. The London/Cambridge split was tedious, and indeed was something I wanted to explicitly address much later, when my own later venture Reality Studios amalgamated with Wendy Mulford’s Cambridge-based press Street Editions to form Reality Street — but we are getting ahead of ourselves here. Hampson: Like Ken, I find factions and factionalizing in the poetry world tedious. In the early 1970s there was a split between a Dada/Surrealist group led by Bernard Kelly and John Digby and the group around Mottram: we had been taught by Eric and liked him, but we had also published and read with Bernard Kelly … as for the London/Cambridge split, like Ken I have tried to address it — in my case through programing at readings and events. I also used to go to the CCCP, if I could. I have admired the work of John James and Denise Riley since the 1970s; I have followed their work, and that of Rod Mengham, Wendy Mulford, Peter Riley, Geoff Ward for decades; I had always thought of Tom Raworth and Barry MacSweeney as part of “London poetry.” At the same time, factions are a fact of poetry life: Wolfgang Görtschacher tried to bring together the various groups he had met in his research, convinced (I think) that we would all find common ground: academic critics interested in Heaney, working-class poets from the Northeast, Cambridge poets, London poets … and the conference split along all the possible fault lines. Jeremy Adler, detail from Alembic 7. Seita: Thinking of Alembic, or, in fact, any other small magazine, as a publishing community, would you say that publishing other poets (whose work or whose attitude to writing you appreciated) created or revealed a sense of community that reading their work alone did not fashion? Did this community remain in print (in some instances I’m sure it did), or did it turn into a community beyond the text, beyond the contingency of being printed alongside one another? How would you distinguish between these two communities (if they can be considered separately)? Writing in Mimeo Mimeo 4, Ken suggests that little magazines need a “community of writers and readers” — such a readerly community being key to a magazine’s continued existence — and that small presses produce and publish work often with a very specific audience in mind. What does that mean, practically speaking, for the writing of poetry and for choosing contributors to a magazine? Hampson: I think that any single issue of a magazine is only a very temporary community — and, indeed, as I have suggested with Alembic 6, there might be more than one community present even in a single issue. Whether they talk to each other outside the pages of the magazine is moot, but the collocation of the work within the magazine creates conversations — even if it is to distinguish what Robert Lax is doing from what Tom Leonard is. However, as you suggest, a magazine might produce another “community” over time in terms of its writers, subscribers, and readers. Like Ken I have always been keen to extend this community: Ken has done this primarily through publishing; I have done this through organizing reading series, events, seminars … for me this has always been an important part of writing and publishing. The activities of writing, publishing, and organizing are interconnected for me. Perhaps as a result, I am not sure what you mean by the distinction between a community in print and a community beyond the text. I am very conscious of belonging to a community of poets and readers in London; I am also conscious of belonging to larger communities of poets and readers nationally and internationally. I am thinking here of poets whose work I know and whom I also know, but I suppose there are also those whose work I know without knowing the poet personally. In some cases, I could regard these as people I could potentially know. On the other hand, although I admire her work, have heard her read, and have even met her, can I meaningfully regard myself as “in the same community” as Susan Howe? What would “community” mean in that case? Edwards: I don’t have much to add to what I said on this either in my interview with Wolfgang Görtschacher or in my Mimeo Mimeo essay. I have always been anxious to extend the community, to make new contacts with other like-minded or even not so like-minded writers and readers, in a spirit of mutual inquiry, as there are dangers of lapsing into parochialism and contentment, however open-minded the intention may have been at the outset. But it’s difficult. Seita: If we consider how certain magazines sometimes inaugurated “movements” (or have been anthologized and canonized as such) or aided the introduction of new writers and new aesthetic forms to new audiences, while others perhaps deliberately wanted to offer more ephemeral glimpses of the contemporary moment, where would you locate Alembic? Was there a sense of the magazine being part of a wider experimental “tradition”? Was it at all important to be considered a “little magazine,” and did you use the term yourself? How did you talk about Alembic, and how have designations and affiliations changed perhaps retrospectively, and could certain terms and concerns now be applied retroactively? Edwards: I don’t know, I think it’s for others to define such things. We found ourselves to be part of a particular “tradition of the new,” but I’m not sure how consciously this was sought at the time. I personally dislike the term “little magazine”! 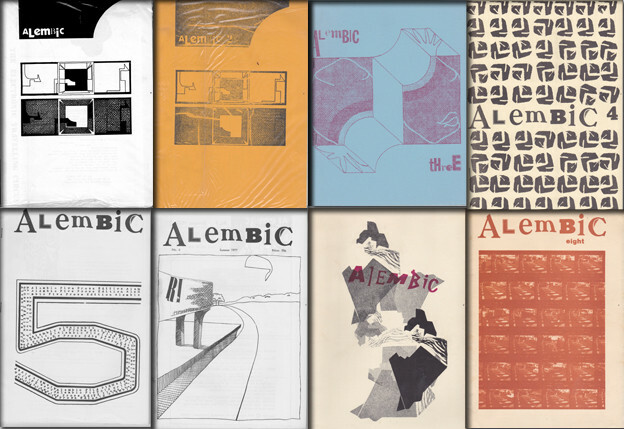 I notice that Alembic 3 and Alembic 4 have the subtitle: “a magazine of new poetry, prose” and “a little magazine.” We thought of it as just a magazine, but by Alembic 8 we were part of the Association of Little Magazines — so the term was obviously in use. On the one hand, “little magazines” have an important role in the history of modernism; on the other, there is that rather demeaning word “little” — and that other tradition where you publish in “little magazines” until your work is recognized by a commercial publisher (or you remain a “little magazine regular” because you have never been upgraded). Seita: Coming back to the “transatlantic axis,” you published many North American poets, like Alan Davies, Lyn Hejinian, Rae Armantrout, Rosmarie Waldrop, James Sherry, alongside British poets like Allen Fisher, Tom Leonard, Barry MacSweeney, and Geraldine Monk. How crucial were dialogue and exchange for you? Which 1970s American small presses or little magazines were you aware of and which ones did you subscribe to or contribute to? Robert, in your interview with Görtschacher you say that — from very early on — you thought of Alembic as having an international outlook. What does internationality mean for a small, noncommercial magazine (say, Alembic specifically) if it is produced and mainly distributed locally, but perhaps received internationally (or at least transatlantically)? Edwards: Speaking for myself, I was anxious to have that dialogue, especially transatlantic dialogue. I don’t know to what extent actual dialogue happened within the pages of Alembic. In the mid-1970s, I was very impressed with the vigorous discussion of poetics that was happening in the USA around journals such as Hills and L=A=N=G=U=A=G=E. That wasn’t happening in the UK. In fact, I always felt people were very buttoned up, or after a reading poets in this country would go for a drink, but never discuss poetry. My own encounter with some of the poets who came to be known as the Language writers was accidental — as I have said, a chance meeting with James Sherry in New York in 1976, for instance, led to further correspondence with others such as Charles Bernstein and Bruce Andrews. By the way, I returned briefly to the Bay Area in 2010, and met up with Lyn Hejinian, who told me she had been very excited when Alembic first published her in the late 1970s — she felt she had established herself as an international poet! Hampson: Like Ken I was (and remain) anxious to have that dialogue. Ken made two trips across the US in 1975 and 1976, which had a significant impact on the way Alembic developed. Through Alembic I was briefly in correspondence with Alan Davies (whom I have never met): I received copies of his magazines Oculist Witnesses and 100 Posters, and published work in 100 Posters. David Miller put me in touch with the Waldrops, and they regularly sent me copies of Burning Deck books. Through David I also saw copies of Gil Ott’s Paper Air and Cid Corman’s Origin (and had work published in Origin). I was aware of Sulfur and Alcheringa through Compendium. I was also aware of Hills and L=A=N=G=U=A=G=E. I later got to know Charles Bernstein and Bob Perelman, but that was in the 1980s and after. I made a number of visits to the US in the 1980s and later, mainly to New York and Philadelphia. For me this dialogue has really taken place since Alembic, but in large part initially because of Alembic. In this case, the virtual community of readers has become an actual community. I have probably already explained something of what I meant by the magazine having an international outlook. I had just returned from a year in Canada and, through my Bengali girlfriend, had acquired a network of Bengali friends in the UK. This was at the time of the war between East and West Pakistan out of which Bangladesh emerged. This “international outlook” was not just an openness to writing from various other cultures, but also a political orientation: an espousal of internationalism rather than nationalism, a support for anticolonial struggles. It also involved a conscious opposition to racism and sexism. Alembic was produced in London, but I didn’t think of it as being distributed locally — not after the first two issues. Distribution very quickly became national and international. Seita: Now, thinking a bit more abstractly and theoretically about what you were doing, I’m wondering what you consider the values of self-publishing and coterie publishing to be — and by “value” I also mean the possibilities of this decision to pursue noncommercial alternative publishing. Were (or are) your decisions to include someone in a publication or to invite someone to read or give a talk (jumping ahead in time: at, for instance, the Contemporary Innovative Poetry Research Seminar at the Institute of English Studies) influenced by the fact that they were part of a particular “world” or that they were friends, or colleagues, or let’s say, affiliates, politically or aesthetically? And again, more broadly, did you see Alembic as a “project”? Was there a specific program? Hampson: I don’t think of Alembic as a whole in terms of coterie publishing. Alembic 1 obviously falls into this category, but Alembic 2 already shows a readiness to open outwards. Alembic 3 has already moved outside our own circles, and Alembic 4 is publishing US poets. Alembic 8 is a long way from any idea of coterie publishing and indicates the trajectory of the project. The values of self-publishing are control over content and format. The first three issues were edited collectively; subsequent issues had a single editor in order to grant complete editorial freedom and to avoid the danger that collective editing might reduce editorial choice to the lowest common denominator. In effect, we backed financially each other’s editorial decisions, based on a trust in each other’s aesthetic judgement and general aesthetic and ideological orientation. This trust had been gained through the workshop process of the early years and through a sense of common commitment to “the tradition of the new.” I was able to pursue my interests in Allen Fisher’s work and David Miller’s work, Ken to explore his interests in prose and translation. For the Contemporary Innovative Poetry Research Seminar, one of my primary considerations has been whether the speaker will bring in an audience. If the seminars don’t bring in an audience, then they will be discontinued by the IES. So that is the baseline. After that, the title gives an indication of the area of poetic practice with which the seminar is concerned (and the broader description of the seminar makes this clear). Because of their location, the seminars are also primarily for graduate students and researchers in the field — though they are also open to the general public, and many poets attend. Geography is also a consideration; since the seminar doesn’t have funds for hotel bills, the potential invitees are largely limited to academics based in London, Canterbury, Cambridge, Oxford, Brighton … including people staying temporarily within this catchment area. I have invited, for example, Andrea Brady, Keston Sutherland, David Herd, Will Rowe, Robert Sheppard, Carol Watts, Peter Jaeger, Ian Davidson, and Stephen McCaffery. Some of these are friends of mine; some are people I have known as part of this world of innovative poetry for many years. They don’t have a common aesthetic or ideological position, but they can be guaranteed to give an interesting paper and draw in a large audience. I have also invited younger scholars, whose theses I have examined or whose papers I have heard at conferences, such as Ben Hickman, Stephen Willey, David Nowell Smith, and Richard Parker. They have given very interesting papers, even if they haven’t always drawn a crowd. I have invited Ian Brinton to give a workshop on J. H. Prynne, because I had heard good reports from a similar workshop he’d given at Canterbury. I was also approached by Agnieszka Klub from the Polish Academy of Science, Jakob Edwards from University of Otago, New Zealand, Susan Rudy from Alberta, and Dorothy Wang from the US. I had heard Jakob speak at a conference, but the others were all new to me. They proposed interesting topics, but they weren’t friends, part of a particular scene, or necessarily ideologically or aesthetically affiliated. Generally, I invite people I know (though they are not necessarily friends or mentally affiliated), whom I know to be working in an interesting area and able to bring in an audience; I also try to promote younger scholars, whose work I know from conferences or PhD examinations; and I also take a risk, from time to time, on people who contact me with a suitable proposal. Ideally, I would want successive seminars to be following a particular theme, but this only occasionally happens. Edwards: There was never an overarching program that was specifically discussed, to the best of my knowledge. Again, speaking for myself, I wanted to publish writing that was adventurous and interesting, and somehow that automatically seemed to mean nonmainstream, noncommercial. Paula Claire, detail from Alembic 7. Seita: Could you talk a bit about any readings in London that you attended or organized? What was the relation between publishing a magazine and organizing or attending readings? Did these events (perhaps more than the poetry) establish a community, because they allowed for more immediate interaction or feedback and different forms of engagement? Did you publish an issue of Alembic in anticipation of — or as a follow-up to — a reading or a conference? Edwards: Live readings in London were always very important. I came in at the tail end of the readings at the then–National Poetry Centre in Earl’s Court. 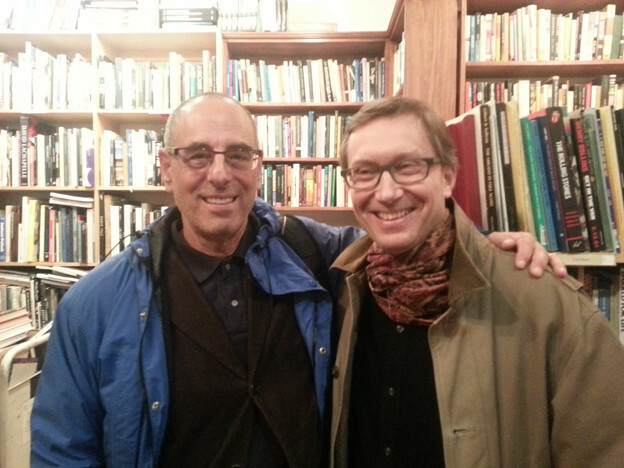 Paul Brown and Mike Dobbie were two poets who organized reading series. Robert can talk a bit more about Future Events, which we organized. In 1977, through the short-life shared housing (in effect, licensed squatting) project that I was involved with, I was offered the use of a farmhouse in Orpington (Lower Green Farm), on the outskirts of London. The property had been blighted because it was in the path of the planned M25 London orbital road (which later took a different route, actually). I had plans to establish an artistic/literary community there, and both Robert and the artist Erik Vonna-Michell lived there for a while. Robert and I organized a series of talks/workshops with Bob Cobbing, Allen Fisher, and Eric Mottram, in an attempt to get more discussion going than seemed to happen at readings. Later, when I moved back to London, I organized readings and performances together with Paul Brown and Allen Fisher, at a community hall near where I was living in the Elephant and Castle district of London. They went under the banner of RASP (an acronym culled from the names of our respective presses: Reality Studios, Actual Size, and Spanner). Among those performing were Iain Sinclair, Elaine Randell, and Paul A. Green in a musical performance with his friend, the keyboard player Vincent Crane. It was very important to organize and attend readings for all the reasons you suggest. This was where the local community was established. It was also important for the response of the audience — rather than any feedback provided. As Ken says, there wasn’t much critical feedback on work in the London scene — except in the form of invitations to read or to submit work for publication. Cobbing ran Writers Forum workshops, but eschewed actually commenting on work. Mottram’s critical work was more concerned with mapping fields, with making information available about what was going on, rather than with elaborating an aesthetics or undertaking close reading. Mottram ran three big conferences at the Polytechnic of Central London in the early seventies, which were major events. None of the rest of us was in a position to organize a conference. Postgraduates just didn’t do that. We didn’t have any access to funds; we wouldn’t be allowed to book university space. This is part of the context for the Saturday courses we ran at Lower Green Farm — where we did have the space. Three Saturdays — Cobbing, Fisher, Mottram — with readings by the poets and then lectures from the poets and discussion about their work. Part of Allen’s paper is reproduced in the new The Marvels of Lambeth, edited by Andrew Duncan. We had intended to publish transcriptions of the tapes, but the work of transcribing proved daunting. There were various attempts later to generate this critical discourse and discussion. Robert Sheppard ran a regular group meeting in his house in Tooting. So: readings and events were important for the dissemination of the work and for the creation of a community (which was an audience and a readership). There was a lack of critical discourse around work produced in the London scene. We didn’t tie the publication of Alembic to readings or events: Alembic followed its own rhythm, dictated by funding and time available from our other commitments. Seita: If the idea of working as a group came out of an interest in Dada and Surrealism, as you suggest, Robert, in the interview with Görtschacher — in what way do either of these avant-garde groups, for you, exemplify a model of writing and publishing collectively perhaps more than, say, the writers surrounding Black Mountain College, or the Beats or the New York School poets? Or were the latter also important influences? Alembic 3 was an explicit homage to Dada and Surrealism and the editorial states: “in this issue we’re featuring a number of writers who’ve learnt from — or whose procedures derive from — dada/surrealist practices … dada & surrealism are a major source of vitality in twentieth-century art.” You also subtitled Alembic “a magazine of new poetry, prose and graphics.” Did the interest in different media also arise from an engagement with Dada and Surrealism? Hampson: The idea of working as a group came from Dada and Surrealism for purely historical reasons. I went to an exhibition in 1966, celebrating the fiftieth anniversary of Dada, and this had a considerable impact on me — in particular, from the idea of artists working as a group rather than as single individuals. I followed Dada through into Surrealism (and another kind of group practice). I am not sure whether my interest in different media arose from my interest in Dada or vice versa. I think the latter: in my teens, I was very consciously exploring literature, visual arts, music, and film with the group of friends I had made in the sixth form (who formed the nucleus of Zoom Cortex some years later). I came across the Beats in the same period, but because of the emphasis on individualism, drugs, and spirituality, didn’t find them a usable model of community — as against the political issues that were foregrounded by Dada and Surrealism. I came across Black Mountain as an undergraduate and became very interested in that — in part because it crossed media; in part because it mapped onto educational communities. I was pleased to have an association with Dartington’s performance writing program later in my career, and Black Mountain was in the back of my mind in the formation of the Poetic Practice group (the Centre for Research in Poetics) at Royal Holloway. The New York school, like the Beats, didn’t seem to me to offer a usable model of community in the early part of my career. The creation or recognition of a community textually through citation has become of more interest to me in recent decades. Seita: Many early avant-garde journals are now being digitized (and hosted online, by, for instance, the Digital Dada Library, Princeton’s Blue Mountain Project, Eclipse, Jacket2, Modernist Magazines Project, and the Modernist Journals Project). Have you thought about digitizing Alembic? While undoubtedly this has advantages for access and distribution, digital files give an object a new materiality. How does the uploaded jpeg/pdf or retyped page affect the reception of a journal and the meaning of its contents? With reference to his own Eclipse online archive, Craig Dworkin calls the digital archive “a set of little fetishes against forgetting.” How do you relate to that? Hampson: I haven’t thought about digitizing Alembic — mainly because I have various other projects in hand. I wouldn’t be opposed to it, but there would be real problems with Alembic 7 — with its slashed pages, its ghost printing, its sheets of sandpaper … the materiality of the codex is foregrounded in some of the pieces there and that wouldn’t translate. Edwards: I can reveal that my later journal Reality Studios is in the process of being digitized (by the University of Pennsylvania). I hope the entire archive of back issues will be available online soon. [Editorial note: in the weeks since this interview occurred, Reality Studios has indeed been digitized as part of Jacket2’s Reissues series.] It may be possible to do this with Alembic. No substitute for the original editions, of course, and I take Robert’s point about the “Assemblage” issue and the loss of materiality — but it would be amazing to have it all accessible in digital form. Seita: In what way did purge (Hampson) and Reality Studios (Edwards) differ in their poetic outlook or editorial choices from Alembic? It seems to me that you, Ken, were very interested in questions about poetics, poets writing about poets, something which L=A=N=G=U=A=G=E (which in fact only published criticism/reviews/experimental prose) cultivated, and of course you went on to publish many more writers now commonly affiliated with “Language” in your magazine. How does Alembic fit into this or the magazine context of the 1970s? Alembic precedes L=A=N=G=U=A=G=E, and then there’s some overlap later. Lastly, if we think of the little magazine as a “forum,” what kinds of questions and challenges does it debate or should it debate, what kinds of actions or changes should it propose, if at all? And can it? Edwards: Reality Studios was an attempt to present news and discussion about poetry alongside the poetry itself, in a more immediate way than Alembic (the issues were appearing further and further apart). The first volume of Reality Studios was issued in monthly parts over a year: each issue usually consisting of ten or twelve mimeographed sheets, stapled together and posted to a mailing list of perhaps forty to fifty people. But it wasn’t possible to sustain this immediacy, and the last five volumes of Reality Studios (it ran for ten years, until around 1987) were litho-printed A5 sized paperbacks issued annually. Commissioning book reviews, essays, and responses to writing was the most challenging part. Eventually, Reality Studios became a book publisher, morphing (via a merger with Wendy Mulford’s Street Editions) into the present-day Reality Street. Hampson: Alembic 8 mentions that Alembic 9 will be edited by me, and there is an issue on file: poems by Lyn Hejinian; poems by Cid Corman; an essay by Corman on “The Art of Measure”; poems by David Miller; an essay by David Miller; poems by the New Zealand poet, Alan Loney; poems by Nicki Jackowska; poems by Geraldine Monk; poems by Michael Carlson; poems by Dennis Mizzi; poems by Mike Dobbie; reviews by myself and David Miller. But for the next two years I disappeared into full-time teaching, and, when I reemerged, the moment seemed to have passed. I came back to purge much later. This was set up as an occasional publishing project, which could be activated from time to time with each issue focused on a particular political event. The intention is to mobilize a rapid response to something current. This necessarily involves calling on various friends (or members of a particular scene) but also assumes a particular aesthetic and ideological orientation for each issue. It is conceived as being comparable to various kinds of one-off political actions — such as the benefit reading Harry Gilonis organized, at the time of the first Iraq invasion, for Médecins sans Frontières. The issues were planned to be slim pamphlets produced by offset litho with rubber stamps for the cover title. They were designed to be low-cost, easy to produce and easy to distribute. I would do a hundred copies and disseminate them as quickly as possible. I did not expect to make back the money spent on printing. I did not receive submissions. Because it was irregular, I did not want subscribers. I was now in the opposite position from that of the Alembic period: now I had a salary, but was time-poor. This way of working was designed to fit the new conditions. The time-consuming aspects of Alembic — the lengthy planning and negotiating for contributions; the big, sixty-page print job; the streams of submissions; the handling of subscriptions — were replaced by this different way of working. My sense was that Ken took the opposite path with Reality Studios: after starting with monthly short publications, he moved to a fully professional journal. Alembic preceded “Language writing” and then they overlapped as you say. As I said earlier, I have a memory that Charles Bernstein was a subscriber, but this might be a false memory. Poets associated with “Language writing” (Alan Davies, James Sherry) began to appear from Alembic 4 onwards. Reality Studios built on what Alembic had achieved, but Alembic itself would not necessarily have gone the same way, if it had survived. I think Alembic promoted the work of certain poets associated with London, such as Lee Harwood, Allen Fisher, David Miller through those issues that focused on their work: it published their work, it published critical work by them, it tried to contextualize their work. The interview with Allen Fisher has recently been reprinted as an important document. It promoted the work of US poets such as Rosmarie Waldrop, Lyn Hejinian, and Rae Armantrout. It was also engaged in raising questions about poetics: in Harwood’s “Surrealist Poetry Today”; in Barry’s “open field notes”; in Miller’s “Notes on Poetics.” There was also a certain amount of reviewing of work related to the magazine’s project. Seita: Lastly, how would you characterize the little magazine scene in the UK or US today? Are you following any particular poets’ work, do you subscribe to a magazine, do you read some of them regularly? Edwards: In the UK, so-called “little magazines” are almost defunct, but they have been to a large extent replaced by webzines and other online forums. Print magazines seem to have survived more successfully in the US (and I particularly follow Chicago Review and Golden Handcuffs Review), but for how long I don’t know. The only UK-based magazine I currently subscribe to is PN Review. Tears in the Fence and Poetry Wales are interesting magazines that struggle on valiantly in print. The days when you could take copies of a poetry magazine into a bookstore or a branch of a bookstore chain in this country and expect them to stock it are long gone. Reality Street publishes book-length collections by poets that interest me: most recently, Maggie O’Sullivan, Jeff Hilson, Carol Watts, Andrea Brady, Peter Hughes, James Davies, and I have just published a very much delayed book by Paul Brown, originally submitted in the 1980s! I’ve also returned to my earlier interest in experimental prose fiction, and I’ve enjoyed publishing recent books by Richard Makin, Johan de Wit, Sean Pemberton (who I didn’t realize until his book was out is a former student of Peter Barry’s), Leopold Haas, and John Gilmore. Hampson: I have a sense that there is still a very lively UK publishing scene, but the emphasis now seems to be more on collections (and presses) than on little magazines. Joe Luna runs a lively magazine, Hi Zero, out of Brighton; Anthony Barnett has just launched a new magazine Snow; and there is the monumental slab of Vlak, but I am more likely to access poetry in the form of individual collections from Reality Street, Shearsman, Salt, Veer, Bad Press, Knives, Forks and Spoons, Equipage, Crater, etc. The lack of bookshops prepared to carry small-press poetry and magazines is a factor. There are also various online magazines, like HOW2 and Jacket, or less well-known e-magazines like Blackbox Manifold, that do the work formerly done by print magazines without the problems of magazine distribution. The UK poets I follow include Allen Fisher, Redell Olsen, Sean Bonney, Carol Watts, Keston Sutherland, Andrea Brady, Tony Lopez, Sophie Robinson, Jeff Hilson, Jennifer Cooke, Tim Atkins, Marianne Morris. 1. Wolfgang Görtschacher and Andreas Schachermayr, “Interview with Ken Edwards: From Alembic to Reality Street Editions,” in Contemporary Views on the Little Magazine Scene (Salzburg, Austria: Poetry Salzburg at the University of Salzburg, 2000), 233–64. See also in the same volume: “Interview with Robert Hampson: Exploring Different Forms and Formats,” 388–426. 2. Ken Edwards, “UK Small Press Publishing Since 1960: The Transatlantic Axis,” Mimeo Mimeo 4: 19–25.